This is a fairly simple single sheet catalog that Spectravideo released in 1984. It features games for the Atari 2600, Atari 400/800, Commodore Vic-20, Colecovision, and the Spectravideo Personal Computer System. Not surprisingly the system with the most titles listed is Spectravideo's Personal Computer System. All of Spectravideo's 2600 games are represented here, with one exception: Chase the Chuckwagon, which was only available through a special offer with Ralston-Purina. 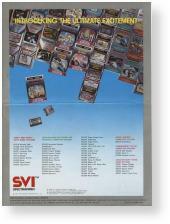 The reverse side of this catalog features Spectravideo's QuickShot controllers.